Left picture shows an example in which the infrared guide heating system has been installed in an X-ray photoelectron spectroscopy. 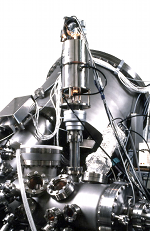 The long component in the top center of the photo is the GVH-model infrared guide heating system, which acts as a clean heating source. 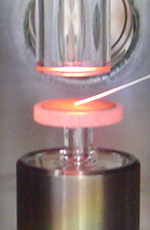 In the clean heating of samples, the sample receives infrared rays inside a circular cylindrical pre-chamber (in an ultra-high vacuum) under the infrared guide heating system, rising in temperature and discharging impurities. 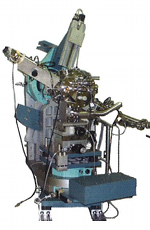 The cleaned sample is transferred in the ultra-high vacuum to the analysis chamber on the right side by means of a conveying mechanism, without being exposed to the atmosphere. 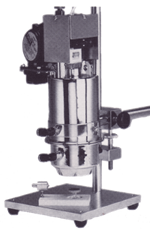 This system prevents the contamination that can occur from exposure to the ambient atmosphere, allowing high-precision analysis of a clean sample.